Welcome the warmer weather with these 10 spring essential oil diffuser blends. They are sure to put you a little spring in your step! April has officially found us and it is beginning to look more and more like Spring! While it is exciting that Spring is here, we often don’t get to enjoy the outdoors as much as we would like to because of the rain and mud! Thankfully you can enjoy the wonderful scents of Spring by using essential oils in your diffuser! Many essential oils such as lemon, lavender, and geranium remind us of Spring! You can use the oils in combination with others to create pleasant blends which bring wonderful Spring scents into your home. These easy to make diffuser blends will truly bring the outdoors in so that your whole family can enjoy the wonderful scents of Spring! The Perfect Spring Diffuser Blend includes 4 oils: grapefruit, geranium, lime, and spearmint. Get the full recipe for this blend here. Fresh & Clean Diffuser Blend: Freshen up your indoor air and bring the wonderful scents of Spring indoors! Get the recipe which uses lemon, lavender & rosemary at the link here. Puddle Jumping Diffuser Blend: I am loving the name of this blend! You will need citronella, geranium and patchouli to make this blend! Check out the recipe here. Citrus Blast Diffuser Blend: This blend is sure to remind you of the wonderful citrus smells that come with spring & summer! Get the recipe which uses bergamot, lemon, lime, orange, & grapefruit here. Green Grass Diffuser Blend: Do you love the smell of fresh cut grass? Bring that smell indoors using blue cypress, chamomile, vetiver, & lemongrass. Get the recipe! Bring May Flowers Diffuser Blend: For the most part we are just happy that the snow is gone, however seeing flowers pop-up really make us realize that the warm weather is around the corner! To make this recipe you will need clary sage, lavender, geranium, & chamomile! 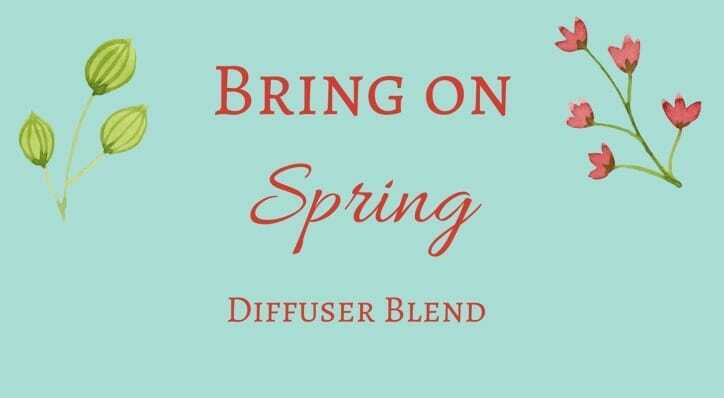 Bring on Spring Diffuser Blend: Yes! Let’s welcome spring! This blend uses grapefruit, geranium, & lemon! Check out the recipe here. Breezy Diffuser Blend: Not only does this blend smell great, it will also provide you with respiratory support! Get the recipe here which includes eucalyptus, grapefruit, & rosemary! Mojito Diffuser Blend: Who could resist this blend?! Fill your home with this wonderful mojito scent using lime, grapefruit, tangerine, & spearmint.Check out the recipe and also get a free printable with 15 other spring essential oil diffuser blends! Fresh Air Diffuser Blend: This blend is perfect to use during your spring cleaning! You will need lavender, eucalyptus, and purification (a purifying blend) for this recipe. I am so excited to try out some of these diffuser blends, I think I will try the mojito diffuser blend first! If you don’t have a diffuser, be sure to check out this post about how to get the aromatic benefits of essential oils without a diffuser! Which Spring essential oil diffuser blend will you try first?